I’m lacking on the eat-more-fish goal this year. Baby steps…speaking of, the baby is trying to take some steps. For this quickie we did a his/hers wraps. His was Chicken Caesar and hers was Buffalo Shrimp! I liked this for a really quick, easily customizable dinner. Although it is a sandwich, it isn’t your average lunch-box option. Prep the shrimp: peal, devein, defrost as necessary. Heat a small skillet to medium low heat and add in the shrimp and buffalo sauce. 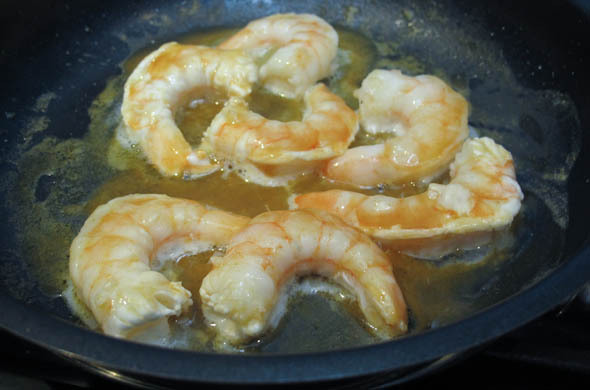 Toss and cook until warmed through (if the shrimp are fully cooked – about 4 minutes) or until the shrimp cook through (if the shrimp are raw – 5-6 minutes). While the shrimp cooks in the buffalo sauce, prep the veggies. 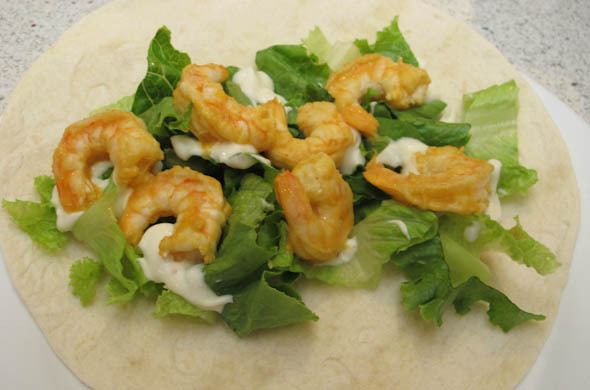 Top the wrap with the veggies, shrimp, and a drizzle of blue cheese. This was pretty basic, as in simple…not being “basic”. Don’t even get me started with PSL and being “basic”. Such a lame descriptor. This was tasty and just what I wanted. Again, not rocket-science, but this is real-life. It is definitely a whirl-wind to pick up the little dude at daycare, get home & see the pups, spoon feed the baby dinner, and then to know what’s up for adult dinner. It is a short window from 6-8pm to fit in baby playtime, dinnertime, bathtime, bottle & bed. Dinner sometimes just has to be dinner and this one hit the spot! I know, the idea + having the ingredients is the only way I can be ready enough for dinner!